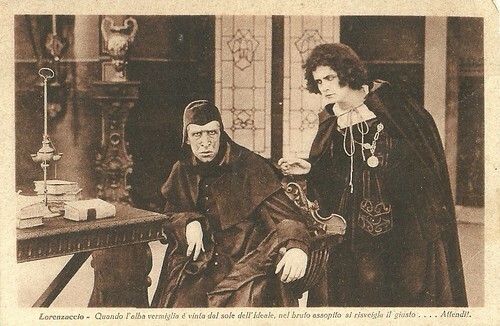 The Italian silent film Lorenzaccio (Giuseppe De Liguoro, 1918) was a production by Lux-Artis. Based on a story by Alfred de Musset, the film tells the story of Lorenzo de Medici. Actress Irene Saffo Momo played the title role. Italian postcard. Photo: Lux-Artis. 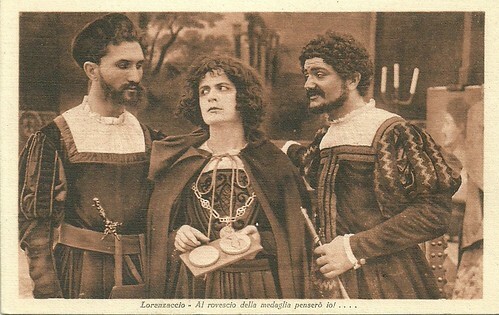 Publicity still for Lorenzaccio (Giuseppe De Liguoro, 1918), starring countess Irene Saffo Momo, in the middle on this card. Caption: I will think of the retro of this medal!... 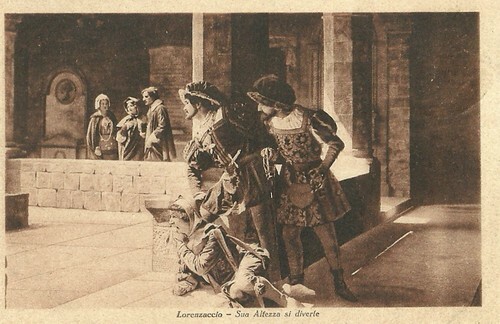 The card depicts the opening scene of the film, in which Lorenzaccio tells the artist Benvenuto Cellini (Camillo Talamo) who has to leave Florence on instigation of duke Alessandro (on the right, Camillo De Rossi), he will take care of it, confirming his own corruption and Cellini's integrity. This scene was suppressed in Alfred De Musset's play, even if it was in his manuscript. 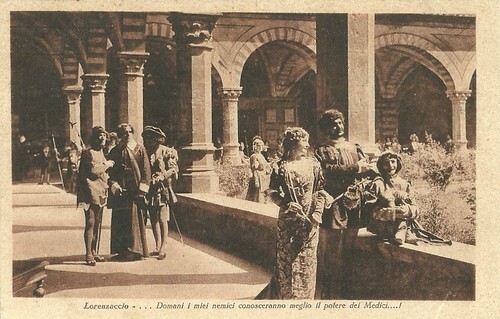 In Lorenzaccio (Giuseppe De Liguoro, 1918), young Lorenzo de Medici (Irene Saffo Momo), nicknamed Lorenzaccio, vows to restore the republic at Florence, but it is his own cousin Alessandro de' Medici (Camillo De Rossi), Duke of Florence, who rules as tyrant, helped by the Pope and the army of Emperor Charles V, who are the real powers. Lorenzaccio becomes a loyal servant to the Duke, helps him in his debaucheries, abducting a girl under her brother's nose. Later the duke has set his eyes on the pious and married marchioness Cibo (Lia Monesi-Passaro), who is warned by her brother-in-law, the cardinal Cibo (Alberto Castelli), but she has decided to sacrifice herself and try to mould the duke in the right direction by offering herself. Meanwhile Luisa Strozzi (Sara Long), member of the rival family to the Medici's, has an involuntary affair with marquis Giuliano Salvati (Luigi Saltamerendo), a man in the duke's circle. In Lorenzaccio's palace, his uncle Bindo Altoviti and Venturi, a gentleman, wish to know from Lorenzaccio whether he will join their conspiracy against the duke. But when the duke, as suggested by his cousin, offers them a promotion and privileges, despite their republican talk, they immediately accept. This confirms Lorenzaccio the power of corruption. Covered in blood, Pietro Strozzi appears to his father, the Republican Filippo (Ferdinando Del Re), and Lorenzo, saying he has killed Salviati because of his sister. When Alessandro serves as a - half naked - model for a portrait by Tebaldo Freccia (Adolfo Quintini), Lorenzaccio steals his coat of mail which always protected him and throws it in a well. Lorenzo has a mock duel with his aid, but becomes totally outrageous, predicting his murderous act. The duke orders the arrest of Pietro, and his father, powerless, unmasks Lorenzo's real intentions. He can only leave for Florence, Lorenzaccio tells him. Strozzi's daughter dies before him, he finally wants to revenge himself but is struck down. Pietro is freed and learns of his sister Luisa's death. The duke is pleased with Luisa's death, misses his coat of arms and has set his eyes on his young aunt Catherine. The night he proposes to kill his cousin, Lorenzaccio warns noblemen to prepare for revolt, but none of them believe he'll do it. The cardinal warns the duke of Lorenzaccio, but he dismisses his warnings and follows his cousin to his bedroom, where Lorenzaccio kills him. Lorenzaccio flees to Venice with Filippo Strozzi, but refuses his Republic ideals, accepts his fate and is murdered. The masterminding Cardinal Cibo appoints the docile Cosimo de' Medici to duke, on behalf of Pope Paul III and Emperor Charles V.
Since opponents to the tyrant's regime fail to use Alessandro's death as a way to overthrow the dukedom and establish a republic, Lorenzo's action does not appear to aid the people's welfare. Written soon after the July Revolution of 1830, at the start of the July Monarchy, when King Louis Philippe substituted King Charles X of France, the play contains many cynical comments on the lack of true republican sentiments in the face of violent overthrow. While the original play was only intended to be read and not staged, it has been staged since, first by Sarah Bernhardt as a star vehicle for herself in 1896, and later with Gérard Philippe in the title role in the 1950s in Paris, a production which reached Broadway in the French version presented by the Théâtre national populaire and directed by Jean Vilar in 1958 for 7 performances. Bernhardt's example of an actress playing the title role was followed many times after. The play's plot also served for several Italian film adaptations; after the 1918 one also Lorenzino de' Medici (Guido Brignone, 1935) and again for Lorenzaccio (Raffaello Pacini, 1954) with Giorgio Albertazzi as protagonist. Italian postcard. 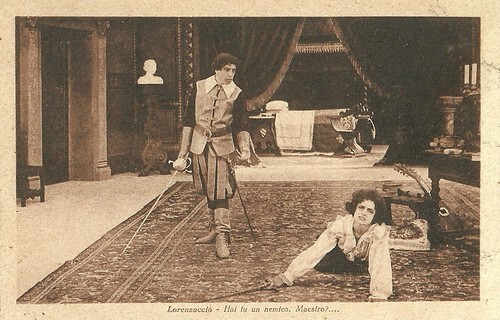 Publicity card for Lorenzaccio (Giuseppe De Liguoro, 1918), starring Irene Saffo Momo. Caption: His Highness amuses himself. Italian postcard. 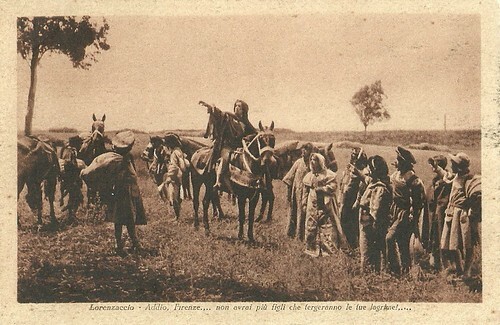 Publicity card for Lorenzaccio (Giuseppe De Liguoro, 1918), starring Irene Saffo Momo. Caption: Tomorrow my enemies will know the power of the Medici...! Italian postcard. 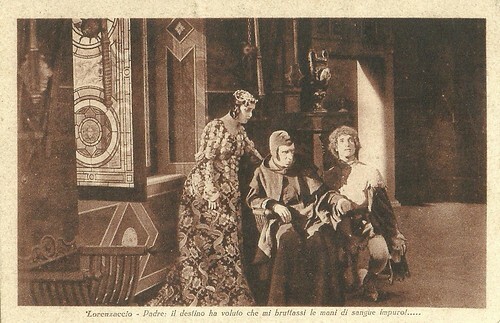 Publicity card for Lorenzaccio (Giuseppe De Liguoro, 1918). Source: Vittorio Martinelli (Il cinema muto italiano 1918), Wikipedia (Italian, English and German), and IMDb.